Green Smoothies (Baby kale, spirulina powder, mango, strawberries, chia seeds, and water) with a vintage covered glass dish that I bought at a thrift store for $3. 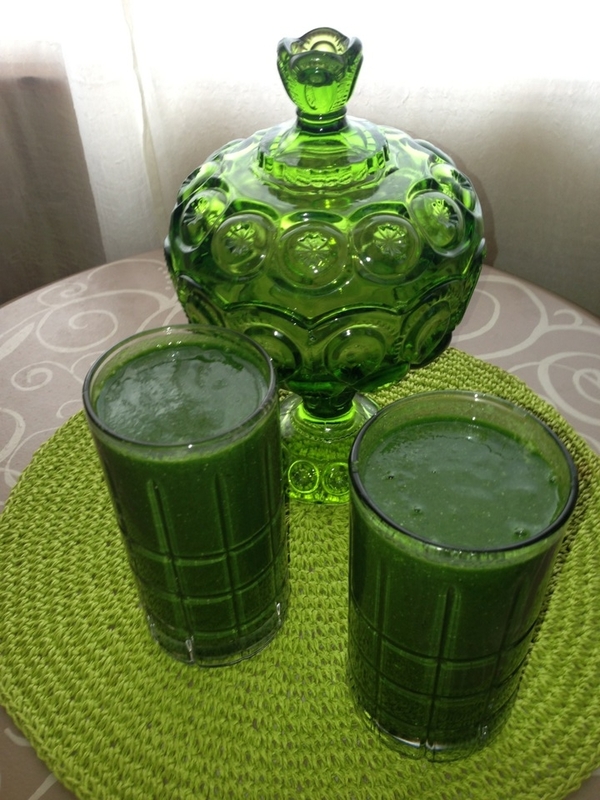 It feels empowering to report that Mike and I have fueled every morning of 2013 with a luscious green smoothie. We love how satisfying they are and how they hold our hunger over until lunch. The addition of chia seeds makes them especially filling. My weekly shopping list always includes plenty of fresh ginger root and cilantro since those are two of my favorite additions. I love the zing that they give my taste buds. 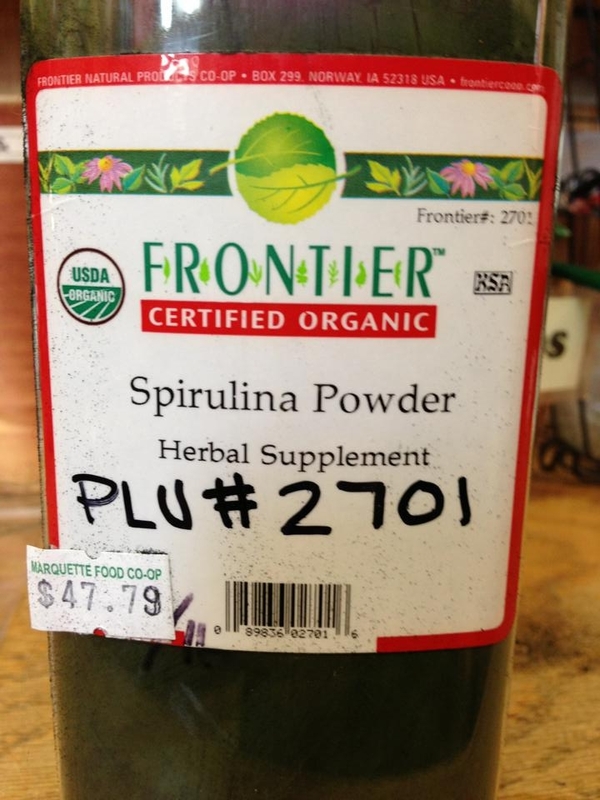 Another ingredient that I have been adding to our smoothies a couple times a week is Spirulina Powder. I found Spirulina powder in the bulk spice section of our local co-op. I was able to buy a small amount (about a cup) from the Marquette Food Co-op in the bulk spice section and I add approximately four teaspoons to the Vitamix before blending. A couple times a week I also add Wheat Grass Powder to our smoothies. One of my future projects is to try to sprout my own wheat grass at home. 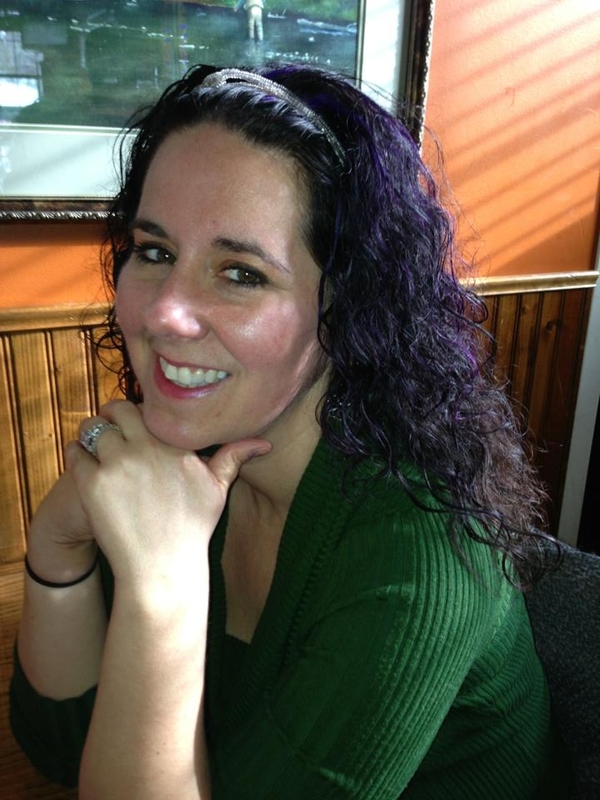 Amy during a date Night at the Landmark Inn in Marquette on February 9, 2013.
he thinks that my skin is glowing from all the fresh fruit and vegetables that I have been eating. Upper Michigan winters are harsh and normally in February I notice that my skin looks dull and is in desperate need of sunshine. So obviously, Mike’s comment really made me glow. He may be biased, but we ran into my cousin last night and she commented that she could tell from our skin that we are both eating healthy. 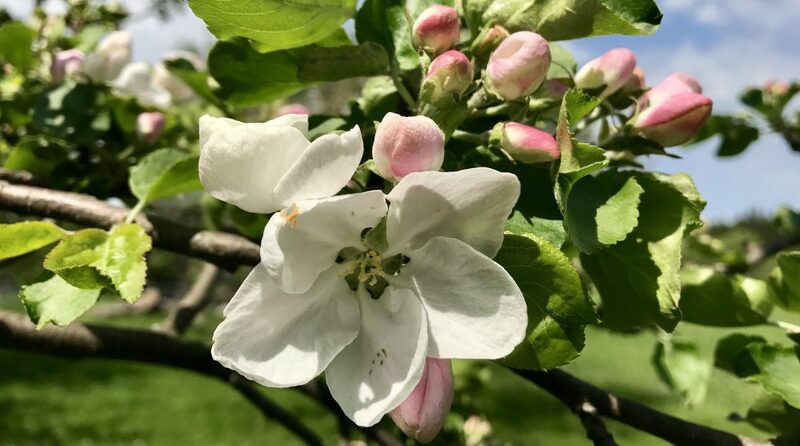 Talk about a marvelous incentive to eat more plants! 1. Commit to one NEW recipe a week (it cannot be something you have made before). 2. The meal and day of the week is optional (breakfast, lunch, dinner, dessert, or snack) It can be a main entrée, a soup, salad, or a side. 4. Share serving size and PP values. 4. If the recipe contains any unusual or “exotic” ingredients share where you shopped. 5. Give a recipe review. Is it something that you would make again? Would you make any variations?. 6. At the end of the month give Amy a hard copy of the recipe and she will print and make cookbooks for all the participants. In addition to a cookbook we could even have a pot-luck event after one of our meetings to sample our favorite recipes. 5. *Optional ~ post pictures of your recipe experiment on our facebook group. This Recipe Challenge has been a great incentive to commit to new recipes because it is important to me that I am a role model and do not let my Weight Watchers members down. 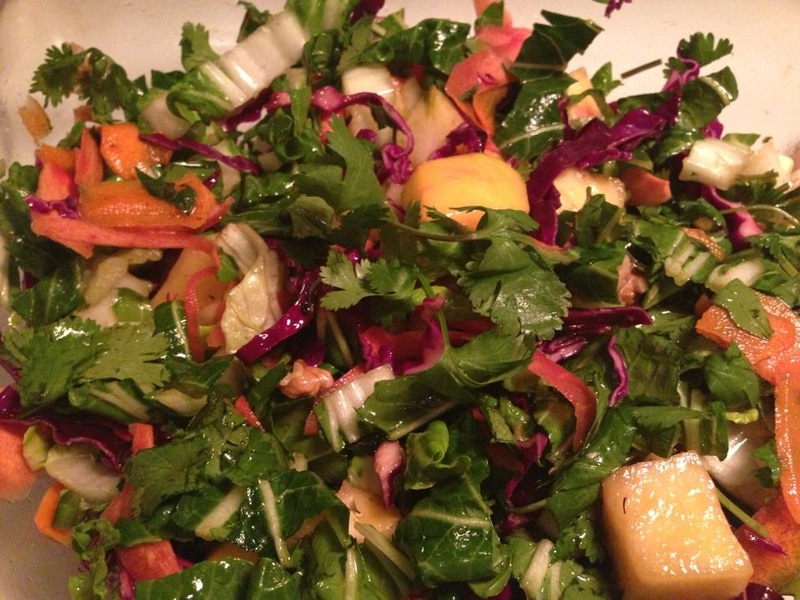 My number one goal for my first recipe was that I wanted to try a new fruit or vegetable. 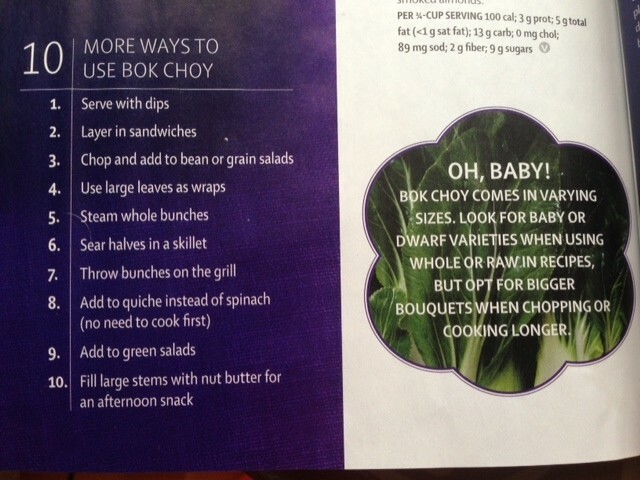 While I have had Bok Choy before in dishes, I had never purchased it myself. 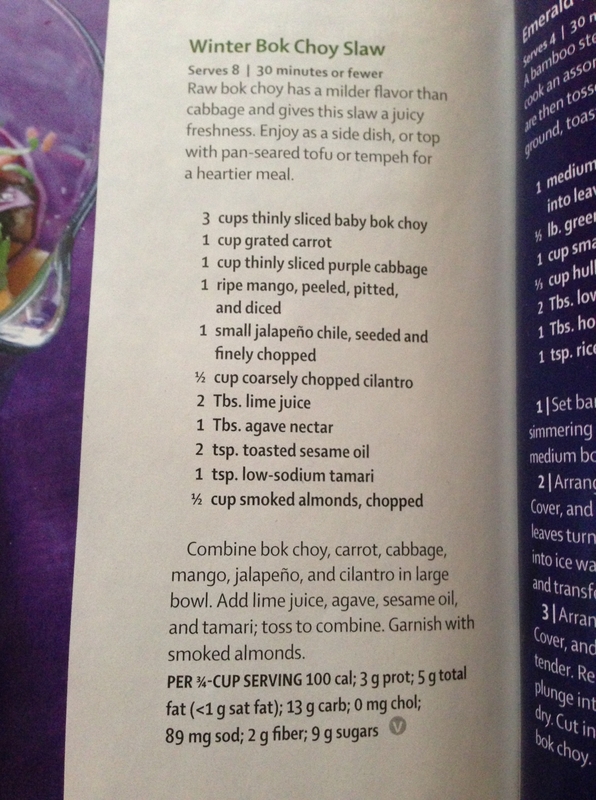 I was tantalized by a Winter Bok Choy Slaw recipe that was featured in the February issue of Vegetarian Times magazine. In 2012, I subscribed to VT and am always excited when a new issue lands in my mailbox. Though, regretfully, I have only tried a couple recipes. This is about to change! I highly recommend VT for vegetarians and non-vegetarians alike. 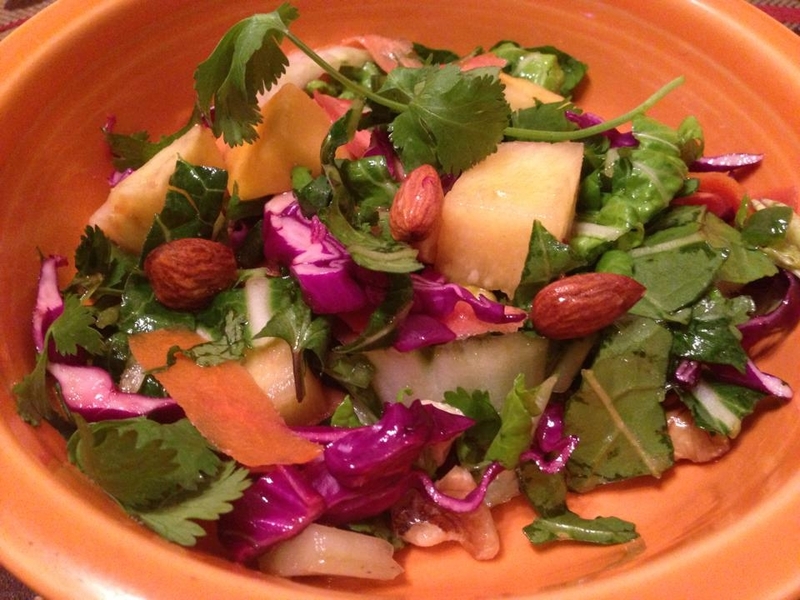 The magazine features incredible recipes that utilize an abundance of fruit and vegetables. 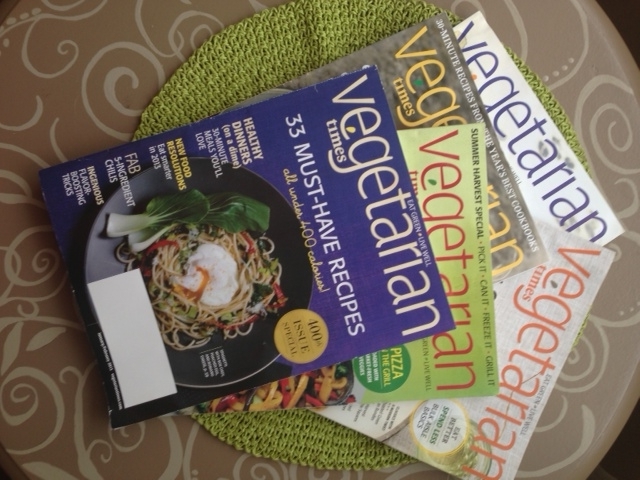 The magazine is informative and I find it is a terrific educational tool to help me learn more about nutrition. The recipe made approximately nine cups (I added extra Bok Choy) and was a tasty addition to my lunch last week. The flavor of the slaw improved as it sat in the refrigerator and it is definitely a dish that I will make again. Because Bok Choy is sturdy this would be a fantastic salad to bring to a pot-luck. The raw nuts that I purchase from Target. instead of the smoked almonds. The mango was so delicious in the slaw that the next day I also added some pineapple. Both were a sweet and juicy accompaniment to the zesty cilantro and spicy jalapeno. Raw nuts are a staple in our house and I buy a container every couple weeks. I found an unsalted mix at Target and it includes: cashews, almonds, pistachios, hazelnuts, and walnuts. 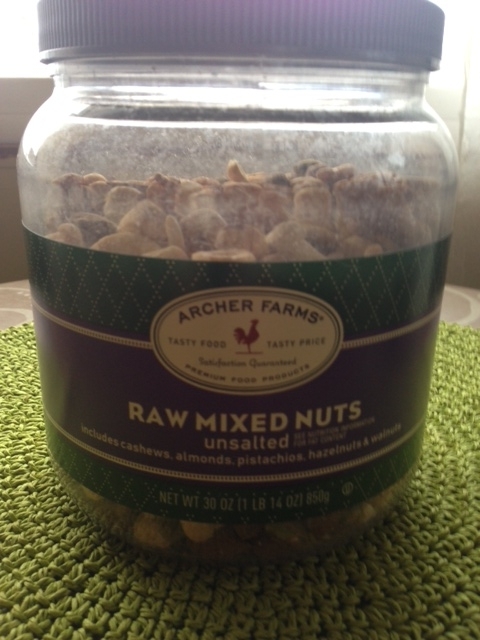 Many of my Weight Watchers members cite that nuts can be a trigger food and I always recommend that they try raw nuts. Raw nuts are filling, have many health benefits (including healthy fat and protein), and I personally find that raw nuts are not as addictive as roasted, salted ones. The key with nuts is to portion them out because the Points Plus value can add up very quick. I eat the nuts on their own for a quick mid-day snack and I often use them to top a salad so I make sure that I am getting protein. 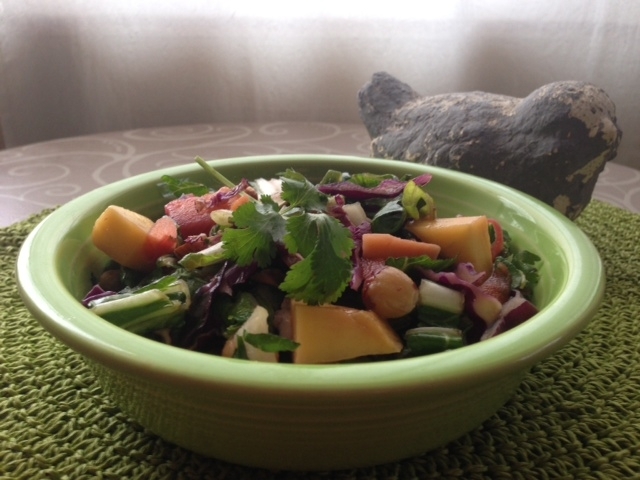 Winter Bok Choy Slaw. The taste is as vibrant as the colors. What a flavorful way to perk up a bland February day! This was part of my lunch today. Five days later and the Winter Slaw is still appealing and crunchy. What will be on my plate this week for the February Recipe Round-Up? I have challenged myself to try TWO new recipes this week. Today I am making a Creamy Peanut Butter Soup with Ginger and Chili from the Weight Watchers 360 Cookbook, Turn up the Flavor. 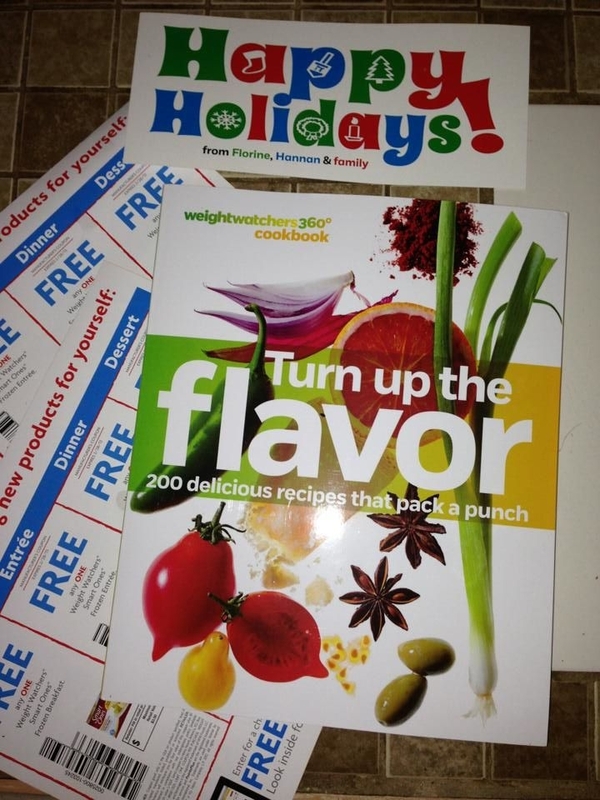 The cookbook was a delightful holiday gift from Florine Mark. 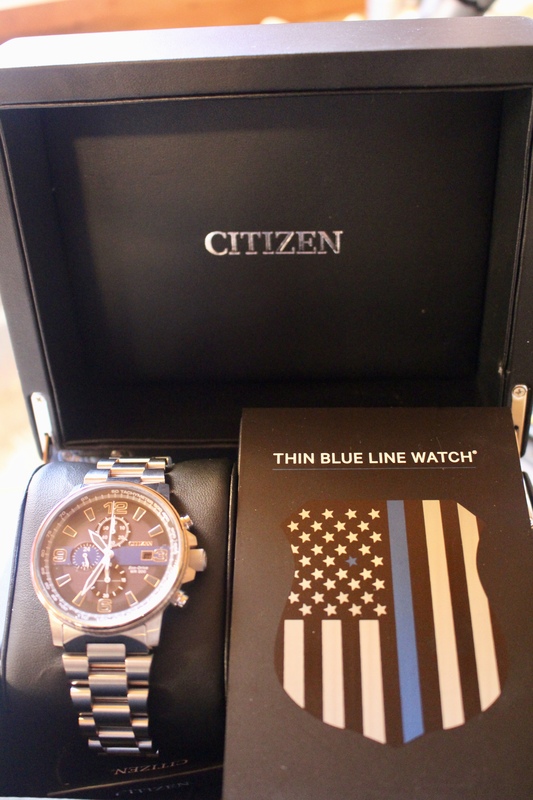 Thank you, Florine, for your tasteful and handy gift! I also have a decadent looking Sweet Potato Veggie Burger recipe on a Pinterest board that I have been meaning to try for a long time. Stay tuned for future blog posts and recipe reviews of the February Recipe Round-Up. Hopefully this post has inspired you to add some new recipes to your weekly meal plan. I would love to hear about your favorites! I have a wide selection of WW cookbooks and my goal for 2013 is to put them to use.